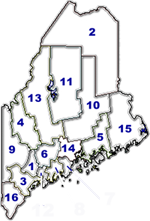 Waldo County, south-central Maine, U.S. It comprises a coastal region bounded to the east by the Penobscot River and Bay and includes several islands in the Atlantic Ocean, notably Isleboro Island. Other waterways are the Sebasticook, Passagassawakeag, and St. George rivers and Unity and Sheepscot ponds. Spruce and fir are the major forest types. Parklands include Lake St. George, Moose Point, Fort Point, Warren Island, and Swan Lake state parks. The county seat is the city of Belfast, an early seaport community settled by the Scotch-Irish in 1770. By the 1790s shipbuilding was a major industry in the town of Searsport, which was settled by soldiers from Fort Pownal in the 1760s. Waldo county was created in 1827 and named for Samuel Waldo, proprietor of the Waldo settlement. Built in the 1840s, Fort Knox was Maine's first granite fort. The economy is based on agriculture, lumbering, fishing, and tourism. Area 730 square miles (1,890 square km). Pop. (1990) 33,018; (1996 est.) 35,822.